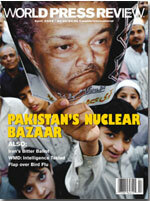 World Press Review is a program of the Stanley Foundation. 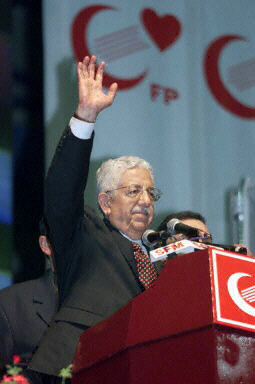 Recai Kutan accepting the leadership of the Virtue Party in May 2000 (Photo: AFP). Though Turkey's Constitutional Court may have succeeded in dividing the opposition, whether the court will be able to conquer it remains to be seen. When, on June 22, the court banned the country's leading opposition party, ruling it violated the Turkish constitution's commitment to secular government, commentators in Turkey were quick to cry foul. Now, only a few weeks later, it seems lines are being drawn for a political battle royal. In accordance with the court's decision, the pro-Islamist Virtue Party (FP)'s funds were confiscated and two of its deputies, Nazli Ilicak and Bekir Sobaci, were removed from their seats in Parliament. By allowing the party's remaining 100 deputies to keep their posts, however, the court managed to avert a snap election and potential political crisis. It also left 19 percent of the parliament without a party affiliation. On July 20, the world witnessed the first step in the opposition's inevitable scramble to reorganize, as Recai Kutantitular leader of the defunct Virtue Partyannounced that he would form the Saadet ["Happiness," or "Enlightened Bliss"] Party (SP). Kutan is widely viewed as a stand-in for former prime minister Necmettin Erbakan, who is banned from holding political office until 2003. Erbakan has seen five of his parties banned in the past. In a press conference announcing his petition to create a new party, Kutan said the SP "is for the people who are victims of the bad economic situation, people who have lost their jobs, who have been made poor, for workers, civil servants, and farmers." While expressing his confidence that the country would eventually unite behind the SP alone, he was careful to emphasize that the party would not try to force an ideology on the Turkish people, that it was committed to greater respect for human rights, freedom, democracy, peace, and welfare. Though the delegates from the defunct FP have not yet formally announced their new affiliation, 51 former FP delegates were present at the SP's first meeting. Kutan is not the only one vying for the loyalties of former FP members and Turkish voters. Long before it was outlawed, the FP was divided between a more conservative faction loyal to Erbakan and a younger, "modernizing" faction. As it happened, the Turkish press seemed more interested in Recep Tayyip Erdogan's imminent return to politics. Under article 312 of the Turkish Penal Code, which targets those who "incite hatred and enmity by showing racial, regional, religious, or class differences" Erdogan, former mayor of Istanbul, was banned from politics and sentenced to four months in prison in 1999 for publicly reading lines from a religious poem. After a three-year court battle, the Constitutional Court lifted the ban the day before Kutan's announcement. The "modernizing" faction of the old FP has rallied around Erdogan, who is expected to form a party of his own before the end of the month [Update: On Aug. 14, 2001, Erdogan formed the Justice and Development Party. 54 former representatives formerly affiliated with the Virtue Party announced their membership in the new party WPR]. According to a recent poll cited on July 21 by Agence France-Presse, voters have rallied around Erdogan as well: 74 percent of respondents said they would favor his faction, as opposed to a meager 14 percent who said they would favor the SP. There have been early signs that Erdogan's popularity is eroding support for the SP. Since Erdogan's return to politics, three delegates have resigned from the party, whittling the party's base of support down to 48 delegates. The Turkish press, which has long opposed article 312 as an impediment to free speech, reacted to the news with excitement. Hasan Cemal, in the July 21 edition of the liberal Milliyet, called Erdogan's banishment from the political stage "a shame for democracy," and applauded the court's reversal. "But the source of this shame still exists," Cemal continued, "Article 312 continues to hang over the head of Democracy like the sword of Damocles… [Continuing the process of] democratization, and changing this law, will speed Turkey's entry into the European Union. When," he asked, "Will [Prime Minister Bulent] Ecevit's government… make good on its promises to democratize the country?" In his July 21 article for the pro-Islamist Yeni Safak, Cengiz Çandar was likewise more enthusiastic about the court's decision to allow Erdogan back into the political fray than he was about the formation of the SP. "The first successor to the Virtue Party has arrived," he noted flatly. "The Saadet Party will take over some of the ground vacated by the deceased Virtue Party… But the real excitement in the political arena came yesterday, when the Constitutional Court allowed Recep Tayyip Erdogan to return to politics. The probability of changing Turkey's political map has arrived." Murat Yetkin, writing for the July 21 liberal Radikal, was less excited: "I have to admit neither Recep Tayyip Erdogan's popularity nor the dynamism of his friends has affected me. I was affected a statement the spokesman of this new group gave in a recent interview: 'This new party will be transparent like an American political party, and our existence will comfort the military.' What are we to make of a new party whose first messages are to the U.S. Embassy and the Turkish Army Joint Chief of Staff?" A July 21 analytical piece published in Ankara's English-language Turkish Daily News hailed the lifting of the ban on Erdogan as an opportunity for FP reformists to "set off on the road to forming a new party without being hampered by a leadership contest" and predicted that more delegates would defect from the center-right Motherland Party and the Islamist True Path Party. These defections, combined with the broader support base three large opposition parties might control, led the Turkish Daily News to speculate that Ecevit's coalition "will have a tough time of it." Other conservative parties may adopt some of Erdogan's rhetoric in the hope that this will win them some of his popularity. If this happens, Ecevit will have to contend with a more united and formidable opposition. But nobody expects the SP, the successor to the Virtue Party, to roll over quietly. Even The Turkish Daily News, despite its grand hopes for a reinvigorated opposition, concedes that "the conservatives are going to go all out to prevent FP voters from siding with Erdogan. The SP members are expected to begin running a smear campaign, both openly and tacitly." If the fighting among the conservative opposition parties gets nasty enough, then the Constitutional Court may have pulled off a double coup for Ecevit in allowing Erdogan back into the political fray: It will have further splintered the opposition at its most vulnerable moment, while sugarcoating the move with what looks like a step closer to democracyand the European Union.